An 11-year-old boy who was seriously injured in a horrific New Jersey school bus crash believes he is in a bad dream and doesn't remember the accident that killed his teacher and a classmate. 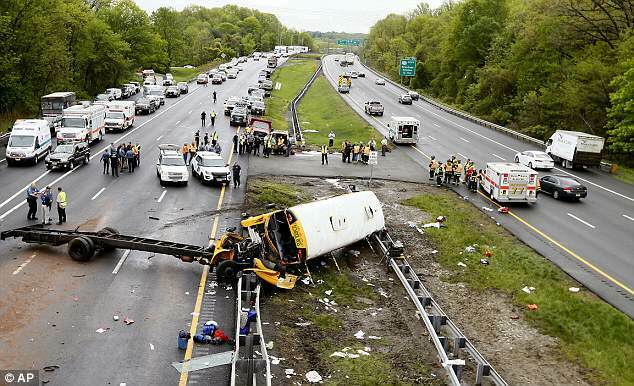 Brendan O'Callaghan was one of the 43 people injured when his Paramus school bus collided with a dump truck on Interstate 80 last Thursday while out on a field trip. 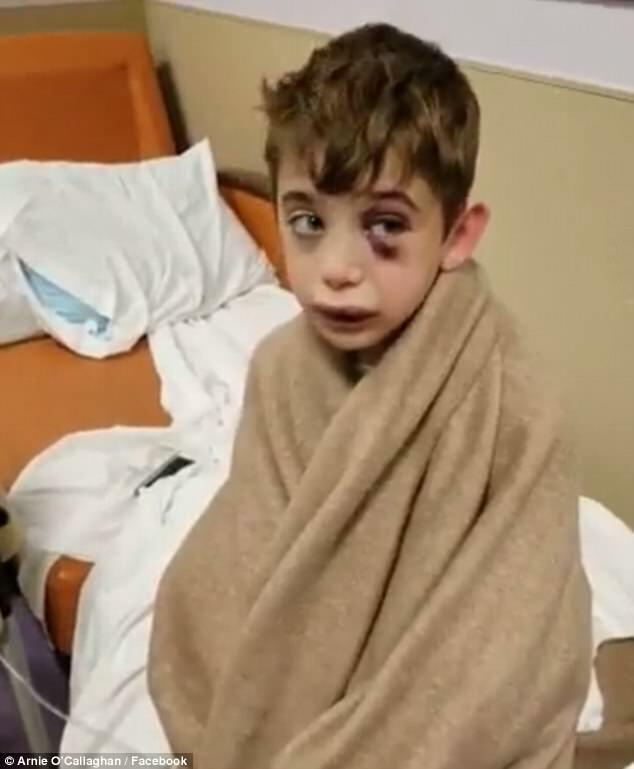 The fifth-grader remains in hospital after suffering a fractured temple bone, broken collarbone, punctured lung and a bruised orbital bone. His father, Arnie O'Callaghan, said the boy's first words to him were: 'Daddy, am I going to die?'. 'He feels like he's in a bad dream,' O'Callaghan told NorthJersey.com. 'My son has no recollection - he asks if he missed the trip to Waterloo Village. Given his serious injuries, O'Callaghan said just the fact that his son was talking was a sigh of relief for the family. 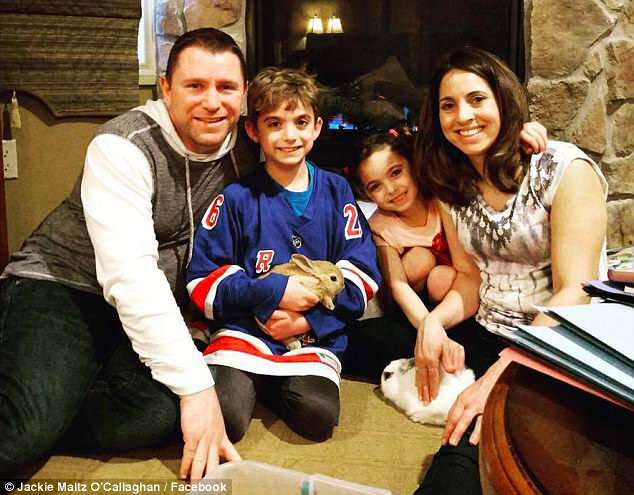 The young hockey fan smiled for the first time over the weekend when he received a surprise gift from the New York Rangers. 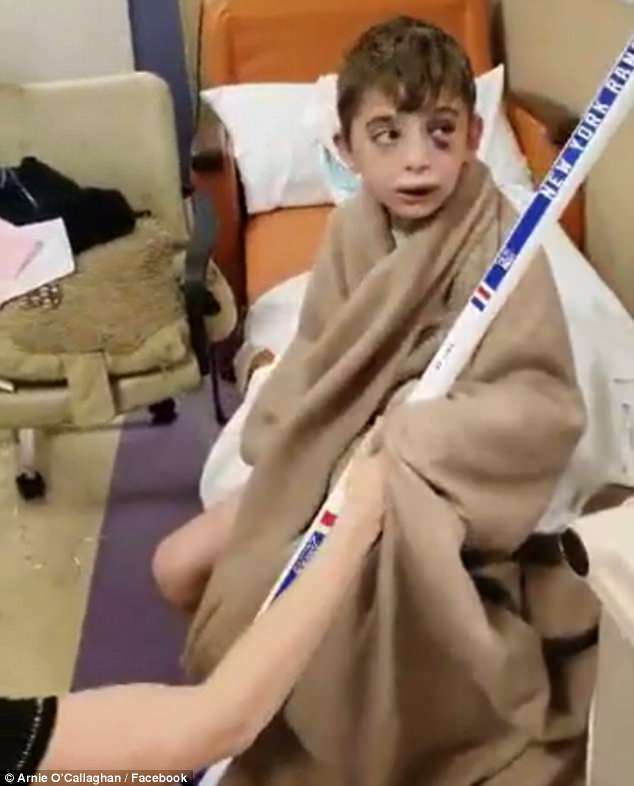 The team gifted him a hockey stick signed by his favorite player Henrik Lundqvist. O'Callaghan said his son hadn't yet been told that his teacher Jennifer Kennedy and his 10-year-old classmate Miranda Vargas had died in the crash. 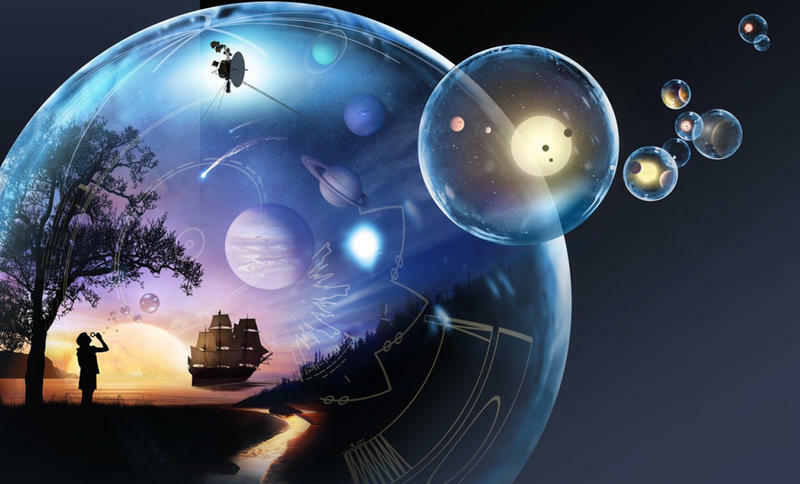 Brendan was particularly close to his teacher, according to his father. O'Callaghan, who is a police officer in nearby Dumont, was out driving when he got the call about the bus crash. He followed other police vehicles with their sirens on until he reached the hospital - not knowing if his son was alive or dead. The bus that Brendan was on was one of three taking students from the school to Waterloo Village - a historic site depicting a Lenape Indian community - for a field trip. 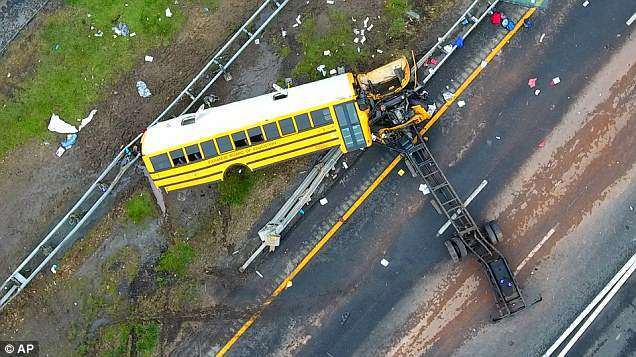 The other buses made it to the site but returned to the school following the crash that left the bus lying on its side on the guardrail of Interstate 80. Police said the crash, which was filmed on a Department of Transportation camera, happened when the bus driver tried to make a U-turn after missing the exit they were meant to take. The driver was meant to have taken Exit 25 to Stanhope but missed it and instead carried on until it saw a police turnaround in the highway. Despite it clearly being marked 'no turns', the driver attempted to make their way across the three lanes of traffic to get to it. Footage has not been released but according to officials who have seen it, the crash unfolded when the school bus driver tried to switch lanes to make his U-turn. That was when the bus was smashed into by the red Mendez Trucking dump truck which was traveling in the same direction. 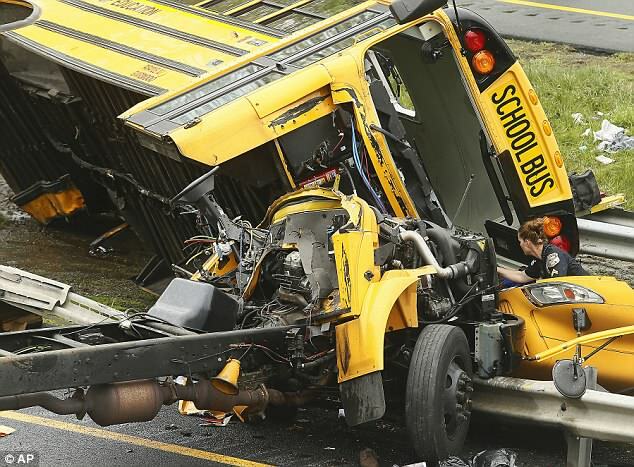 The bus carriage went flying off its chassis and into the median with all of the children inside. There were 45 people on board; 38 fifth graders aged 10 or 11 and seven adults including the driver. The funeral for the fifth-grader who was killed will take place on Monday, while the teacher will be remembered at a service on Thursday.